Christmas and the end/start of a new year often make me nostalgic. This year, around Christmas, I kept thinking about the early days of my relationship with my husband, back before we were married. Getting engaged is a magical, exciting, BIG time in most of our lives. A time that can't ever really be replicated. While the relative calm of married life (we have been married for 8 years) might on the surface seem boring compared to that lively pre-wedding phase, I find that there is also a simple, peaceful beauty in it. 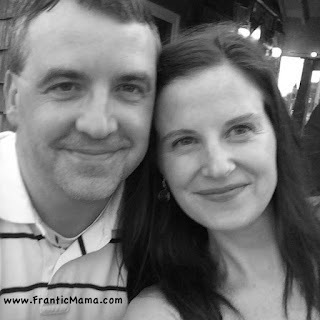 A photo of my husband & me from last summer. I was inspired by Mamalode's theme for January-- Story-- to share a glimpse of my own love story, its quiet transformation over time. I hope you enjoy it, and that other longtime couples can relate to our small corner of the world. You can read my essay, The Small Spot, here. You can sign up for my newsletter, here! Happy New Year! Delightful! Julia!! I heard my heart murmur. Love stories are the most beautiful ever.And yours is studded with stars.I know just what you mean by 'relative calm'.There may be the appearance of initial excitement mellowing down,but sparks still do fly!Especially when it is make up time after an argument.�� I am the uncalm element in the story I share with my husband. He is quiet and always there.I am the noise.He holds while I insist he hold tighter. I love your sweet picture!You are adorable together! "He is quiet and always there"-- yes, I know what you mean. My husband is like that too. I've always really loved his natural calm and mellow tendencies. We make a yin/yang sort of couple :). Always fun to find another couple like us! I love the picture!! And I loved your Mamalode Essay too! Thanks so much for reading and for your support! As I'm sure you know from your own experience, the only photos my husband and I are both in are selfies!